Corey offers inline eddy current testing and offline eddy current testing. A cold finished steel bar may require testing for surface defects when it is destined for critical applications. 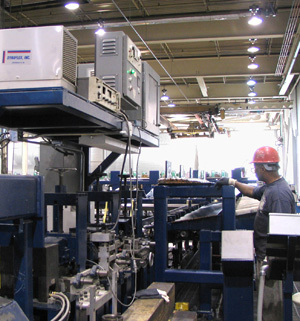 Corey can perform an encircling coil eddy current test to ASTM A108 Level 1 as part of our drawing line process. For more critical applications, Corey Steel can perform a secondary test on our offline eddy current tester using Level 1 ASNT testing operators. Having the ability to test in or offline gives us the flexibility to test material from stock rather than waiting for a full production cycle. Eddy current testing will not eliminate the responsibility of the customer to assure that the recommended amount of stock is removed in the production of a particular part. Since eddy current testing will not detect all defects, the customer should discuss any special requirements with our technical department. We have solutions to meet most needs.